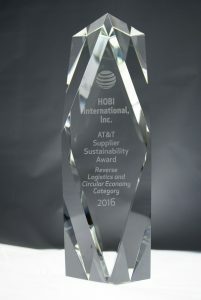 HOBI Receives AT&T 2016 Supplier Sustainability Award | HOBI International, Inc.
[DALLAS, August 10, 2017] – HOBI International, Inc. is receiving the 2016 AT&T* Supplier Sustainability Award in the ‘Reverse Logistics and Circular Economy’ category. HOBI is being recognized for developing a parts recovery and testing process in support of AT&T mobile phone refurbishment operations. The award recognizes suppliers for their support of AT&T and its goals toward sustainable operations. Of the many vendors in the AT&T supply chain, HOBI is one of only four suppliers to receive the 2016 AT&T Sustainability Supplier Award. The company’s outstanding contributions supported AT&T in its supplier sustainability goals and initiatives during the past year. “Being named one of AT&T’s sustainability award winners is recognition of HOBI’s commitment to providing valuable services to our clients while maintaining a strict focus on environmental sustainability practices,” said Craig Boswell, co-founder and president of HOBI. Boswell added that providing solutions to minimize a client’s expense and maximize their ROI while performing superior sustainability practices is the crux of HOBI’s service offering. HOBI International, Inc. is a leading IT and mobile asset management and electronics recycling company serving Fortune 1000 clients. Since 1992, HOBI has provided comprehensive solutions for the remarketing and environmentally responsible recycling of electronic assets. HOBI’s IT and mobile device services teams help organizations big and small process end-of-life electronics with a focus on corporate IT, data, and telecommunications infrastructure. Our services include resale/remarketing, data erasure/data destruction, recycling, environmental and compliance reporting, de-installation services, and reverse logistics management. HOBI, an R2/RIOS and ISO 14001 certified firm, has more than 25 years experience in enterprise asset management and disposition. The company’s pioneering enterprise asset process makes HOBI the leader in its industry. Learn more about how HOBI can achieve value maximization and create customized enterprise asset service programs for your company at HOBI.com. Follow @HOBI_Inc on Twitter for company and industry news.